Why not assist your Wedding Guests in finding their seats by offering Personalized Luggage Tags! The Luggage Tag makes a truly functional keepsake that would surely be used by your friends and family. You can print labels with lines for Name, Address and Phone Number onto the Card, using the insert that comes with the tags as a template . Then add your Guests’ Names and slide the tag and decorative paper backing back into the plastic cover. Lastly, loop the cording through hole at top! 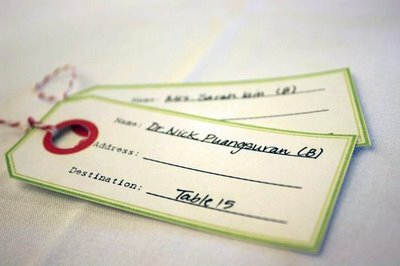 At your Wedding Reception you can then hang the Luggage Tags onto each Guest chair or on the Wedding Place Card Table! This idea can also be used for your ‘Save The Date’ cards! Next post: Guest Book Table Idea!